According to a study conducted by Direct Marketing Association, Digital Marketing industry is worth over $70 billion. Now start ups prefer to promote their brand and products through digital marketing. It is because digital marketing is very cost effective and flexible. They have an overwhelming impact on the consumers. Because of this there is a huge demand for professionals who are skilled in digital marketing jobs. 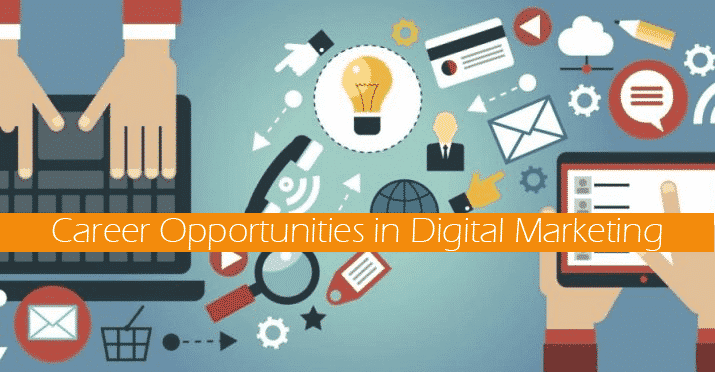 There are over 10 different careers that you can pursue in digital marketing. First you have to know about digital marketing. Read about it and stay abreast of all the news. Then you have to focus on the specialization. It means which job you are going to choose. Understand the business and take a plunge. Here are 10 jobs that you can find in digital marketing. Digital marketing manager is on the top of the pyramid. You will be leading the digital marketing team and others will work under your guidance. You will be reporting to the vice president of marketing in a given company. You have to integrate various processes like email marketing, sales, search engine marketing, social media etc. Here you need an experience of at least 3 to 5 years before you reach to this position. The salary can depend upon company to company but normally you can expect around $70,000 to $90,000 a year. The second most important job in digital marketing is social media managers or marketers. Both are same. You may already know that social media is all about Facebook, Twitter, YouTube and other Web 2.0 platforms. As a social media manager you have to develop strategies for promoting the brand name through Facebook, Twitter, Snapchat etc. Here you have to engage with your customers and build a relationship with them. Social media is all about attracting customer base which is lot younger. You need an experience of 2 to 3 years and salary can be anything between $40,000 and $60,000 depending upon your performance. Content marketing managers are responsible for managing contents like blogging, sales page, copywriting, writing eBooks, videos, email communication etc. Here you work under the digital marketer. Content marketers usually manage a team of content writers but at times they work alone. Right now most of the content writers are freelancers who work from their home and they report directly to the content marketing managers. Here you don’t need any particular educational qualification however you need to have good writing and editing skills. A content marketing manager can easily make up to $40,000 to $50,000 a year. Content Writer jobs are for professionals who are less experienced because it is not a managerial job. Here you just have to write content. However you must have experience in writing. You will be asked to write content on any given topic. Most of the freelancing jobs on the internet are for content writers. There is no educational qualification required, however you must be able to write. The salary you can expect is anything between $25,000 and $30,000 a month. Copywriters are also like content writers however their job description is slightly different than the content writers. A copywriter has to work with entire digital marketing team. For example your social media manager can ask you to write a better post with strong wordings, similarly a SEO executive might ask you to write better ad copy and a content manager may ask you to refine the entire content. Therefore a copywriter’s job is very diverse. Here you need some experience in writing. You can easily make around $30,000 to $40,000 a year. SEO is an overused word. I think everybody knows about it. As an SEO expert you will be responsible to rank the website on the first page of the Google search result. You have to get page indexed on the top of the search result. You will be responsible for keyword research, building backlinks, managing content etc. SEO experts are needed because companies don’t want to spend their money on Google Adwords for getting traffic. SEO jobs are very high in demand and you can easily find a job. However you need to have some experience in SEO field. You can easily make anything between $30,000 and $90,000 a year depending upon your experience. A digital marketing company always needs a SEM specialist. Here the marketing is done through search engines like Google. He will be responsible for things like analysis, bid management, ad copywriting and testing campaigns. If the company is small then the digital marketing manager himself will perform the role of SEM specialist. Here you have to have an experience of at least 2 to 3 years. Salary is around $30,000 to $50,000 a year. Inbound marketing managers will be generating leads and optimizing the conversion rates. The responsibility of content marketers and inbound marketers are quite same. You have to create a strategy for attracting customers. You will create great landing pages that will convert a visitor into a potential customer. You need some experience with inbound marketing. You can easily make $40,000 to $60,000 a year. Conversion Rate Optimizer or CRO is responsible for improving the conversion rate. Here you work with inbound marketer in order to create better landing or sales page. The CRO job is quite similar to the inbound marketer’s job. You have to increase conversion rate at each step of the marketing campaign. CRO expert can make anything between $30,000 and $50,000 a year. Here you will analyze traffic coming to your site. You have to do research about kind of traffic coming on to your site. You must know to work with tools like Google Analytics. You can make around $25,000 to $40,000 a year. So these were 10 jobs in digital marketing. Interested with the position for content writers. How can I get a job on post of Digital Marketing Manager. This is a great post about Digital Marketing. If the belief of the current prime minister is trusted & people want to go cashless & digital then this kind of marketing is the future in India. Thanks! !